Sublime, she appears, dressed in a sumptuous Elie Saab dress. Her radiant beauty and her captivating look light up the red carpet. All eyes are set on her. It is a euphoric and magical moment suspended in time. A special moment. 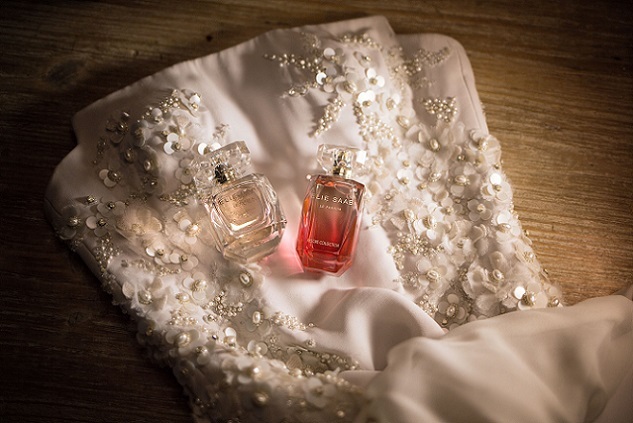 Under the crackling of photographers' flashes, time stands still...This spring, ELIE SAAB Le Parfum celebrates the glamour of the red carpet, by gracing its iconic white flowers signature with carmine red glints. To convey this new exceptional moment, the perfumer Francis Kurkdjian has chosen unusual. colourful and sparkling fruity notes. Juicy, zesty and deliciously sweet, the Red Mandarin essence from Italy illuminates a sensual and solar Frangipani accord. Luscious and tangy, the Pomegranate Nectar accord brightens the heart of the fragrance with its ruby glow: a luminous white bouquet of Jasmine Sambac and Orange Blossom. The intensity of Patchouli prolongs this deliciously addictive trail.